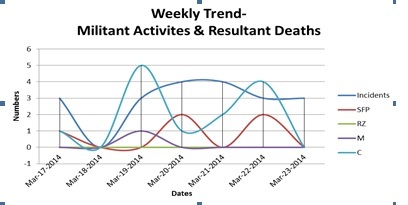 During the week under review, number of incidents have gone substantially up as compared to previous week but resultant deaths and injuries were comparatively lower. 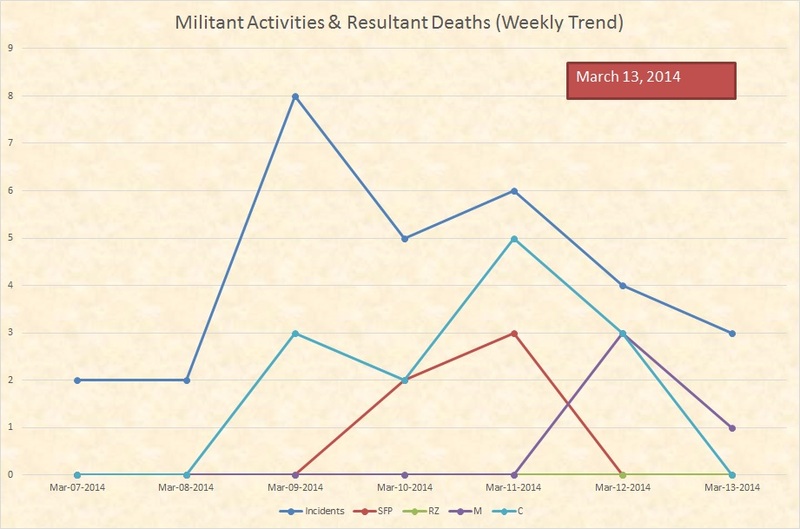 In 33 militant activities of the week, 27 people were killed and 32 others were injured. 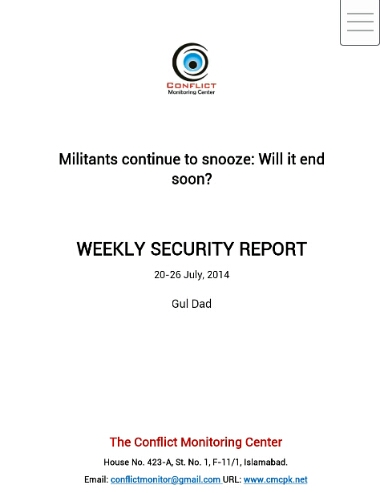 More number of incidents with comparatively lessor impact suggest that militants are yet not able to plan and execute a major militant attack. However, increased number of incidents, especially when they were reported from almost all geographical areas reveal their presence around. A pattern of killing police personnel and attacking police check-posts/ mobile vans is constant for quite some time. Incidentally or coincidentally, violence in Baluchistan had went down after start of operation Zarb-e-Azb in FATA despite the fact that there were no direct linkages between two somehow separate nature of violence centers. However, FATA-KP based militants (read TTP) have already demonstrated their presence in Baluchistan by carrying out suicide attack in Khuzdar last week. Militants might be desiring to exploit weaker law and order situation of Baluchistan to settle and carry out their militant activities. Khuzdar is mainly Baloch dominated area of Baluchistan where Pashtun population is comparatively lower. TTP is mainly a Pashtun dominated militant entity while Lashker-e-Jhanvi (LeJ) is cutting across ethnic lines. Strategic and operational collaboration between TTP and LeJ can allow both of them to operate in troubled Baluchistan while avoiding serious blow from security forces at least under the prevailing circumstances. In hindsight, Baluchistan based militants are likely to welcome militants from FATA-KP to settle in Baluchistan as it can provide them more chances to operate freely given the capacity of the state institutions including but not limited to security forces. How this collaboration if emerges will have some disadvantages to Baluch insurgents as it will weaken their political stance, however, those who are hell bent for violence, and only violence, would like to benefit out of the situation.